Nice is the second most visited destination in France (after Paris) and a tourist hotspot of Côte d'Azur– the French Riviera along the Mediterranean coast. Traditionally, a quaint seaside resort, full to the brim in the summer time, Nice is also a sought after tourist destination in the winter due to its proximity to the French Alps. A number of ski resorts, including the popular Isola 2000, Auron and Valberg/Beuil ski domains are located in only around 40 miles distance from Nice. Renault Clio - popular supermini hire car in France. See also: "Driving in France in a hire car - facts about French car hire". The city’s tourist offer, with a vast selection of museum, historic monuments, interesting culture and last but not least, excellent cuisine, makes Nice a round-year destination. Exploring Nice itself does not necessarily require a car and many of the city’s tourists sites are best to visit on foot. It would be a shame, however, not to take advantage of cheap Nice car hire offers for getting to know the surrounding area. French Riviera is extremely rich in places of interest and just a simple drive along the Côte d’Azur coast is already a pleasurable experience. Car hire is available at Nice Côte d’Azur Airport, as well as in several city center locations and at Nice railway station. Nice car hire is available from renowned rent-a-car brands, such as Europcar, Hertz, Avis Rent-A-Car, Sixt, Alamo, Budget, Dollar, as well as from a number of local providers of rental cars on the French Riviera. There is quite a range of vehicles for rent in Nice and in the surrounding area. The cheapest and very popular small city cars, such as a Citroen C1, Peugeot 107, or similar, can be found with prices starting from around £100 for a week of car hire in Nice. Being Côte d'Azur one of the most affluent areas in France and an upmarket holiday destination, the segment of luxury rental cars here is quite developed. Several rent a car agencies in Nice specialise in premium car hire and limousine rental. See Ferrari car hire in Nice with Platinum Côte d'Azur or Cannes Car Rental. The price of the Italian exotics in Côte d'Azur is rather steep compared to renting a Ferrari (trackday) in England. However, given the influx of wealthy French and Russian tourists to the area, the market for rental supercars in the French Riviera is growing. A credit card with a high limit is a must if you are planning to hire a luxury car in Côte d'Azur. More affordable premium vehicles to rent in Nice, such as Audi A5, Audi TT, BMW Z4, Mercedes SLK or similar, can be frequently found with reasonable prices, through internet search engines of car hire offers, such as Cartrawler, Holiday Autos or E-Car rental. When searching for premium car hire in Nice with Cartrawler, choose 'Exotic/Special' as a car group category. Due to the mild Mediterranean climate of Southern France, Côte d’Azur driving holiday can be enjoyed at any time of the year, avoiding the rather steep car hire prices at the peak of the summer season. However, it is always a good idea to book your Nice hire car well in advance even for the winter time. Please, remember that the Nice Carnival festivities in February bring a lot of tourist to the city, requiring early booking of your Nice car hire. Especially larger rental vehicles, such as MPV VW Sharan, Ford Galaxy SMax, or minibuses (9-seaters), may come in a short supply during the periods of most intense influx of tourists in Nice. Read more about Nice Carnival. Also the annual Cannes Film Festival affects the car hire supply in Nice in May, so bookings for that time of the year should also be done well in advance. Find out more information on Cannes Film Festival (Festival de Cannes) here. Driving in the historic centre of Nice can be a nuisance. 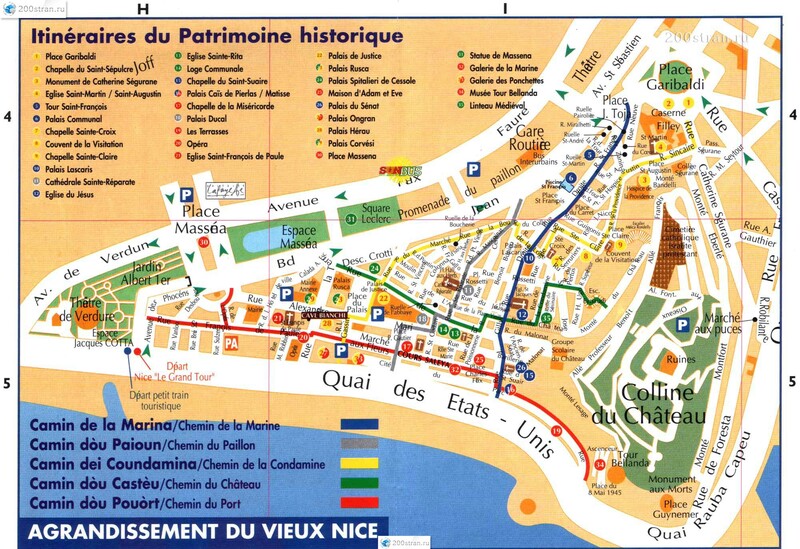 You may find it more convenient to explore Old Nice on foot, or on a bicycle. There are plenty of opportunities to rent bikes in Nice and the number of good bike paths in Nice increases every year. Rental of tricycles, with space for 2 passengers and a driver, is popular too. You can also choose to be transported in style in one of France's most famous and beloved vehicles, the legendary Citroen 2CV. A 2CV hire is available from 2CV Escapade. The beautifully restored Citroen 2CV cars can be rented with an English speaking driver, who also acts as a Nice tourist guide. One of the most iconic sites of Nice is Promenade des Anglais. This over 4 miles long walkway along the Baie des Anges (Bay of Angels), lined with restaurants and beach cafés is a favourite place for tourists and also locals, especially the active ones: cyclists, runners and rollerbladers. See video from Promenade des Anglais in Nice. Near the eastern end of Promenade des Anglais another city’s landmark is an absolute must for tourists in Nice. The daily Flower Market on Cours Saleya square is the essence of Vieux Nice, the city’s old quarter. From very early hours in the morning flowers, produce (including all sorts of exotic fruits and spices) as well as crafts and souvenirs are being sold at the Course Saleya market. During the day the square is a bustling, colourful place with many sidewalk cafes and restaurants on the edges of the market, inviting for a moment of relaxation over a cup of coffee. After the dawn the market turns into a vibrant nightlife spot as the restaurants expand into the square, transforming the market stalls into al fresco dining area. Find Cours Saleya on the map of Vieux Nice, Old Nice (click to enlarge). Another popular tourist attraction of Nice, Colline du Chateau is a hillside with ruins of a medieval fortress. Although there is not much left to see of the castle itself, the beautiful scenery of the location, the man-made waterfall on the castle hill and fabulous views over the Baie des Anges make a visit to Colline du Chateau and absolute must. The castle’s observation platform is accessible on foot by 213 steps staircase or by a lift. If you are visiting Nice in a hire car, a little bit of planning ahead may help you have a relaxed holiday in this beautiful city. Since many tourist attractions in Nice can be comfortably visited on foot and/or are easy to reach by the very efficient and inexpensive Nice public transportation, you may choose to leave your rental car safely parked, while moving around Nice city centre. 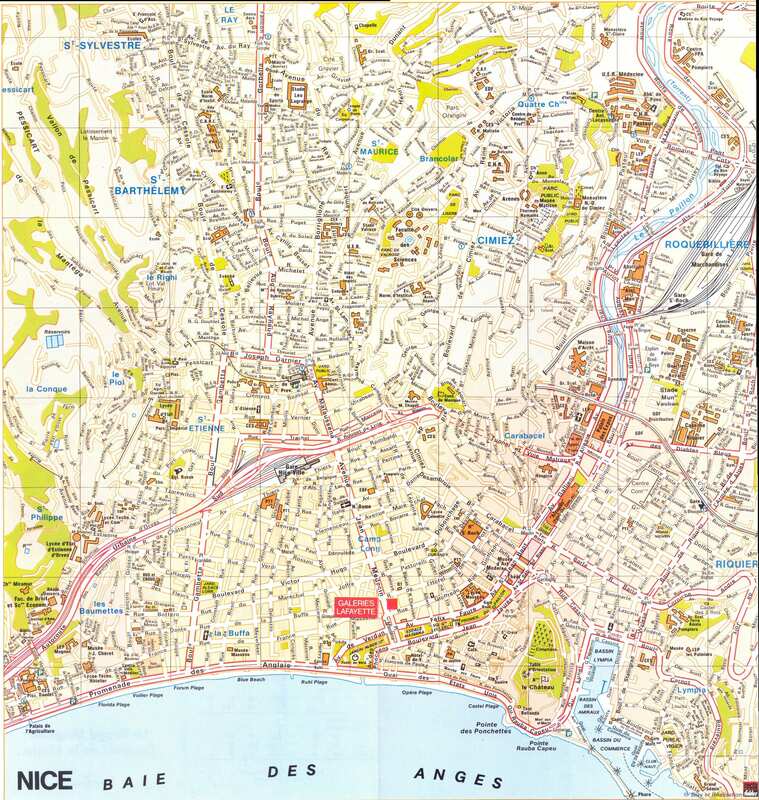 See detailed clickable map of Nice city centre. Street parking in Nice can be a daunting task, especially at the peak of tourist season in July and August. The best solution for motorized visitors in Nice is to rely on hotel parks or public parking lots. The latter come in a decent supply in Nice, but are rather costly. Europcar France offers the VW Golf in the compact class of hire cars. Find a parking lot in Nice (French only- Click on the name of the park, in the right-hand side bar, to see the location and fees). To make the most of your Nice hire car, however, do take time to explore the wealth of tourist attractions on the French Riviera, easily accessible from Nice. Saint Tropez, mecca of all holidaymakers in the Southern France is in less than 70 miles distance south-west of Nice. This once a fishing village, with no major historic monuments, attracts tourists mostly due to its fame as ‘France’s summer playground for millionaires’. The possibility of spotting someone rich and/or famous in Saint Tropez adds up to the charm of the beautiful beaches, promenades, lovely cafes and chic atmosphere of a quaint holiday resort. The drive to Saint Tropez by the coastal road is amid wonderful scenery and with views of both Mediterranean and Alps is an unforgettable experience. Much closer from Nice, in only about 20 miles distance, is another iconic location of Côte d’Azure, the capital of European cinematography, Cannes. The best time to be in Cannes is of course in May, when the annual Cannes Film Festival is held and the city fills with famous figures of the movie industry. However, throughout the year many other important events, fairs and trade shows take place in Cannes, attracting quite a number of visitors, amongst them Midem trade fairs for the music industry, Cannes Lions International Advertising Festival, not to mention the Carnival on the Riviera celebrated during 21 days prior to Shrove Tuesday. The prices of accommodation in both Cannes and Saint Tropez are steep, as to be expected in such an upmarket tourist locations. Using Nice as a base for exploring Côte d’Azure in a hire car can produce significant savings. The privileged location of Nice and good communicational infrastructure allow an easy access to many places of tourist interest outside France. Most car hire companies in France allow cross border travels to a number of European countries. Do check, however, with your rental car provider what conditions apply when driving abroad in a French hire car. On the Cartrawler search engine the information regarding cross border travel can be found under Rental conditions / Rate details of every Nice car hire offer. Since 1st July 2012, the new French breathalyzer law makes it mandatory to carry at least one alcohol self-test unit in every car driven in France. Single-use breathalyzers can be purchased at gas stations, supermarkets and chemists throughout France, with prices starting from around 1 euro. The device needs to be stamped with “NF” – norme française – meaning it has been approved for use in France. Read more about the mandatory breathalysers in France. Find out more information about speeding fines in France. Visit Southern France in a Nice hire car. Car hire in France Côte d'Azur is available from major rent a car companies, such as Sixt, Alamo, Budget, Dollar and Avis Rent a Car. Use Cartrawler France to compare rate for car hire in Nice and book well in advance before the tourist hight season, Nice Carnival and Cannes Film Festival.